There have been several attempts to revive the interest in the Babylon 5 TV series, including JMS’ attempt to buy back the rights for everything. He already has the rights for a theatrical movie, but can not do much with that. Come September 2013 he had enough of this and made a not on his Facebook page, saying that he could do no more and encouraging the fans to “be organized and be loud”, in order to get Babylon 5 back on TV screens and streaming services. Babylon 5 has been away from TV screens for over a decade in the US. He (and we, the fans) want casual viewers to be able to stumble across the series. So – the fans started a campaign – letter writing and attention creating measures. The campaign has already been partly successful. The full 5 year series has been shown on the UK Watch channel, with a trailer referencing #FreeBabylon5, and is currently running in Denmark, Germany and Italy. I have been participating by giving away FreeBabylon5 stuff at a few conventions, and had some fun with that. 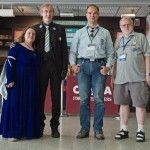 “This is a personal account of my (Babylon Lurker’s) attendance of Loncon3 also known as Worldcon 2014. 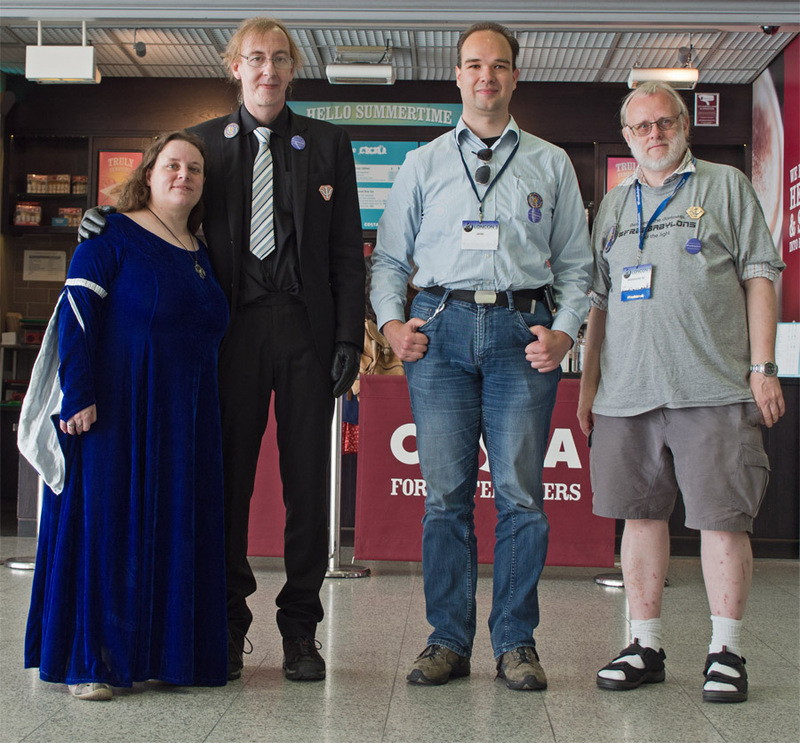 Since I live in the Netherlands this was the first Worldcon I have had available near me since I started to go to conventions. 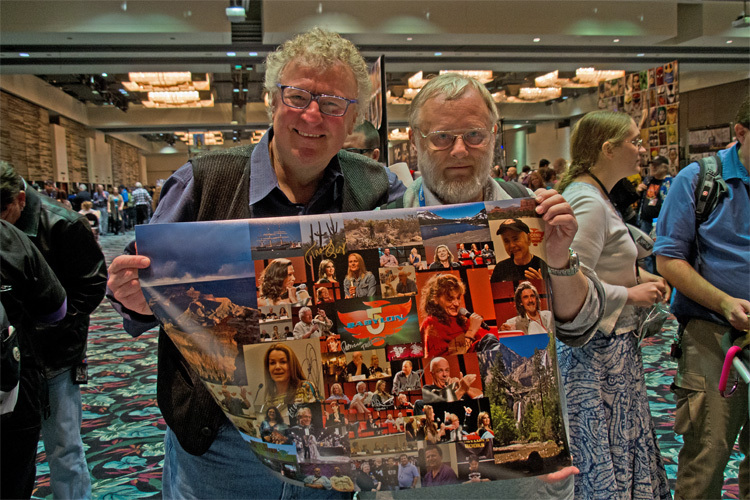 I met Jan M Schroeder at Phoenix Comicon 2013 and Space City Con 2014, and she provided me with some #FreeBabylon5 treats to give away at conventions. The first two conventions were small local conventions in Copenhagen, Denmark with 30 – 150 attendees – and I got to give away a bit of this. One Swedish writer saw my “#FreeBabylon5” badge and immediately reacted by saying that B5 is a brilliant show. The third was Fedcon in Düsseldorf, Germany, a media oriented convention with about 5000 attendees. I did get to give away a fair amount of the #FreeBabylon5 stuff, since I met a fair amount of B5 fans there. Having gone to bigger conventions I decided to go to Worldcon in London this year with a fair supply. I did not have a table, but just walked around, talking to people. I was slightly surprised by the sheer number of Babylon 5 fans I met there. 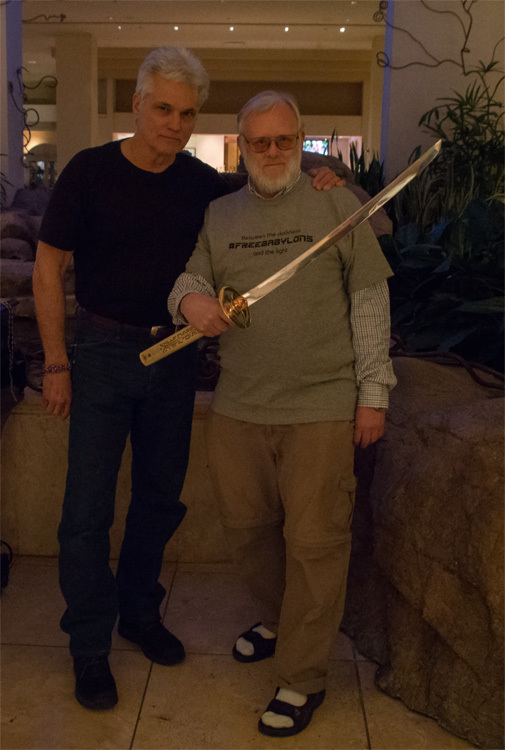 I must have talked to about 100 people during the 5 days, and my impression is that about 80% of those were B5 fans who happily received the FreeBabylon5 stuff. I am aware that B5 is more popular in the UK than in the US, but among the US people I met the number of fans was high. Essentially everyone knew B5, and many of the non-fans had the show on their to-do list. I have to assume that this is because Worldcon attendees have a very wide range of Science Fiction interests, books, films, TV, comics etc. I guess I should not have been surprised at all . On Saturday a Babylon 5 fan meeting was arranged, and in spite of it coinciding with the masquerade we had 40 – 50 people there. Not everyone I met had even heard of the fan meeting. I am sure it could have been bigger if it had been more widely announced. Jan had indicated that the temporary tattoos were quite popular at SDCC, at Worldcon I found that the #FreeBabylon5 ribbons were more sought after. I ran out of the ribbon supply, but I still have some of the tattoos left, and a few buttons/badges, too. This is the text from Jan M Schroeder regarding her Saturday activities at this year’s San Diego Comicon, brought here with permission. Thanks Jan. I have my own comments on what could have lead up to this point, but that will have to wait. Please enjoy. Saturday at San Diego Comic-Con (or the day JMS announced that he’ll do a B5 movie). I got there at a good time, not long after the con opened at 10:00 AM. A little surprisingly, the mezzanine didn’t really seem too much busier than other days so far except for the food area being busier. I’ve got pre-written letters to WB and NBC/Universal out on the table and a fair number of folks took those to mail after adding a little demographic info. Five or six were left with me and I dropped them off to be mailed. The big panel of the day was JMS’ of course. First I went to his signing and got a few things signed that will most likely be destined as fund-raisers. I verified with JMS that he wouldn’t mind if I handed out buttons and postcards before his panel. A new friend, Lukas, handed out at the door and I wandered the room where people were already staying from the panel before. – Ten Grand: JMS is currently negotiating with a major Studio/Network for a series based on this. – Shadowman feature film: He’s two to three weeks from turning in the latest draft. – He couldn’t name it, but he’s working on a project for Universal concerning Rod Serling and working with Carol Serling, Rod’s widow on it. – Again he couldn’t say much but he showed a title card for a show called “Two Streets” that he’s just made a deal with Universal for that he’ll be working with “Walking Dead’s” Gail Anne Hurd. – “Titans” is the name of the Feature film/graphic novel project that was just announced yesterday (see movie thread). So it’s been a really big year for Studio JMS. And due to that, he can now look to doing a feature film for B5. JMS recapped that WB owns everything about B5 except the movie rights and even though he holds the film rights, to take a B5 movie to another studio without holding the TV rights wouldn’t work. There’s one studio in LA that doesn’t care about that – Studio JMS – and in 2015 JMS will write the script. He’ll give WB the opportunity to step up, but if they don’t, Studio JMS will make it in 2016 on their own with a $1-200,000,000.00 budget. A fan asked if JMS might crowdfund part of the film so that fans might be involved and JMS said that he resists doing that because it seems to him that SF fans are an exploited group and he doesn’t ever want to do that – he’d rather accept investor money. Asked about the current situation with streaming Babylon 5, JMS said that it’s all up to Warner Bros. and gave the ‪#‎FreeBabylon5‬ campaign a nice plug, telling of the success in Europe to date and hoping for some movement domestically. A fan asked if the success of a B5 feature might improve the chances of streaming and even future TV projects and JMS said that it would probably have a significant effect, that a good way to get someone’s (WB) attention is to rattle their cage. JMS went on to tell about a story he wanted to do that he wasn’t allowed to in the original show where when Londo was injured, he wanted to do a dream sequence where the actors played different characters but the studio thought the audience would get confused. A fan asked what’s being made not that would equal B5 for being transformative and JMS replied that TV is having a golden age right now with lots of amazing things. being made. He concluded with his regular homily for the fans to never surrender their dreams, that with persistance and talent and luck, can overcome your circumstances and follow your passionss and succeed. In May and June I have been to two conventions , the Fedcon in Düsseldorf, Germany and Fantasticon in Copenhagen, Denmark. At both conventions I was giving away buttons for #FreeBabylon5, a group that campaigns to get Babylon 5 back on TV channels and Internet streaming. You can find more information on the Free Babylon 5 website. I have participated in a few more of the Downbelow podcasts as a guest, and it has been fun following Heidi and Elisabeth discovering Babylon 5, and their – sometimes – uncanny guesses of what is to come. Of course, they miss greatly form time to time, but they are very observant.